Today started out with a seemingly endless blue sky. Very quickly though ( before 9am ) there were signs of the day over developing. Would this ruin the day. A closer look at the forecasts and atmospheric sounds suggested a reasonable thermal day tending to go blue ( no thermal related clouds ) as the day went on. Good. Off to the airfield then. 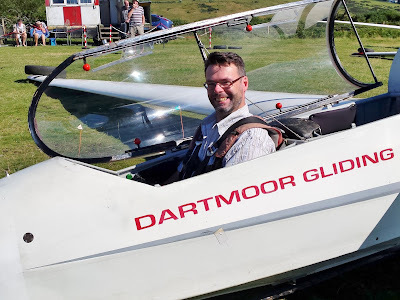 The great news today was the return to the club fleet of K13 G-DDMX and the Zugvogel G-CHXV. 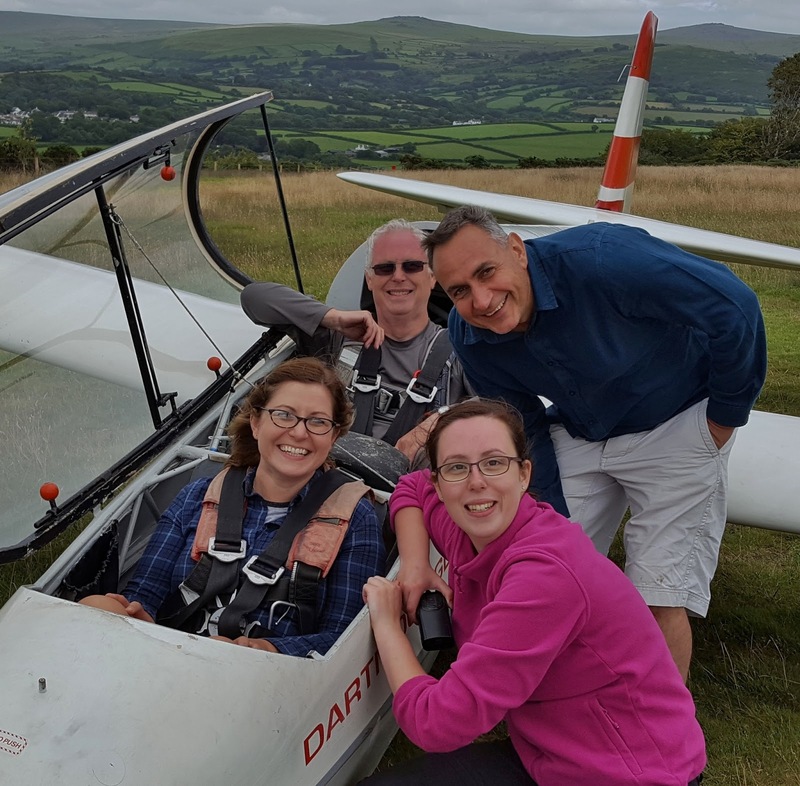 This only happened because several members along with Colin and Area Technical Officer John spent a very busy day on Wednesday sorting out duplicate inspections and the necessary paperwork. The two K8's remain in maintenance but are moving forward. 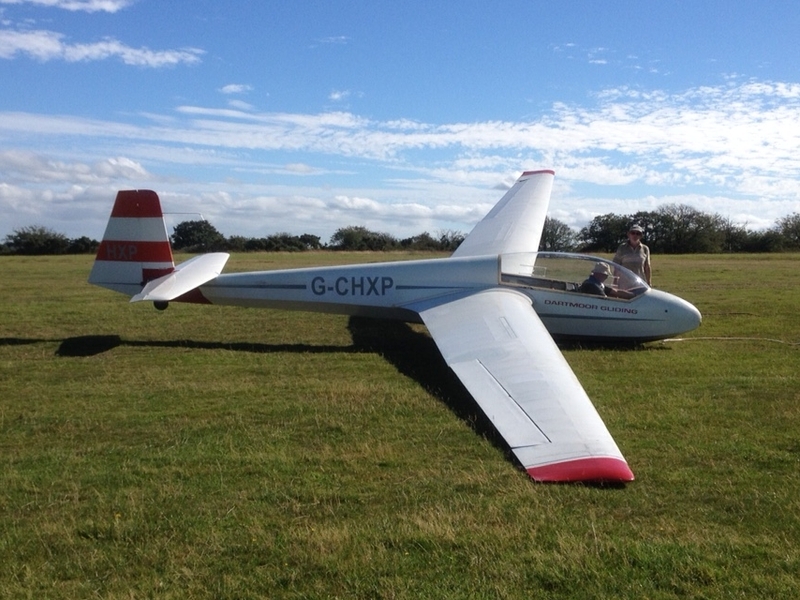 The availability of the two K13's was very welcome as we had a full programme of club flying and visitors. We welcome two One Day Course Candidates, Harry Eastwood and Alan Wood as well as Steve Foxon, SueThorne, and Stephen Wood who visited for Introductory Flights. 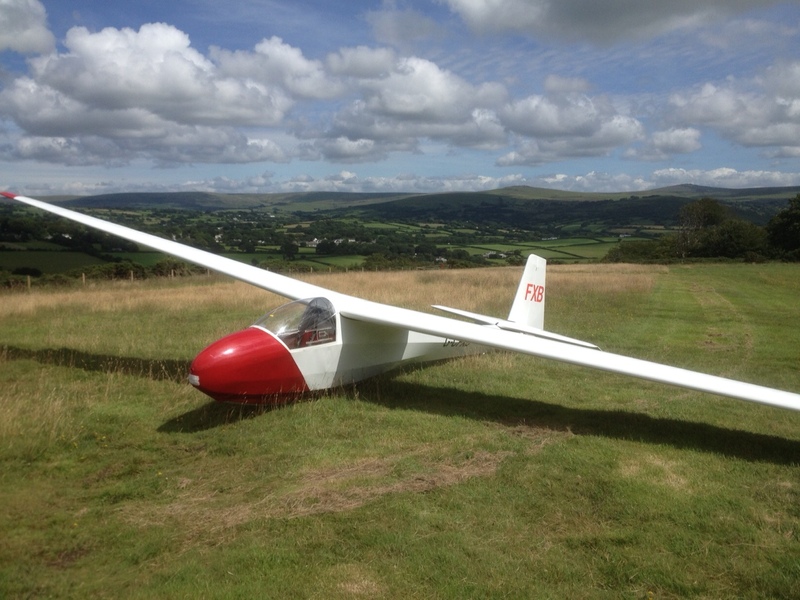 It was soarable right from the first flight. Low down conditions were somewhat difficult, but with care and a little skill, pilots could climb well enough to reach the better ( and easier ) conditions above about 1500 feet. By mid afternoon conditions were mostly blue. Most thermals did not have any cloud above to betray their positions but in some ways this can make things easier as there is no cloud shadow to interfere with thermal generation. 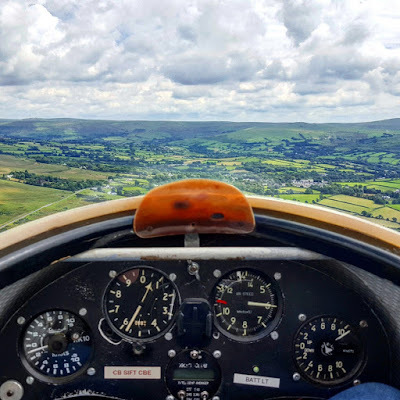 Best flight of the day was by visiting Shennington pilot Clive Smith who disappeared in his beautifully presented K6e for 2 hours and 44 minutes. 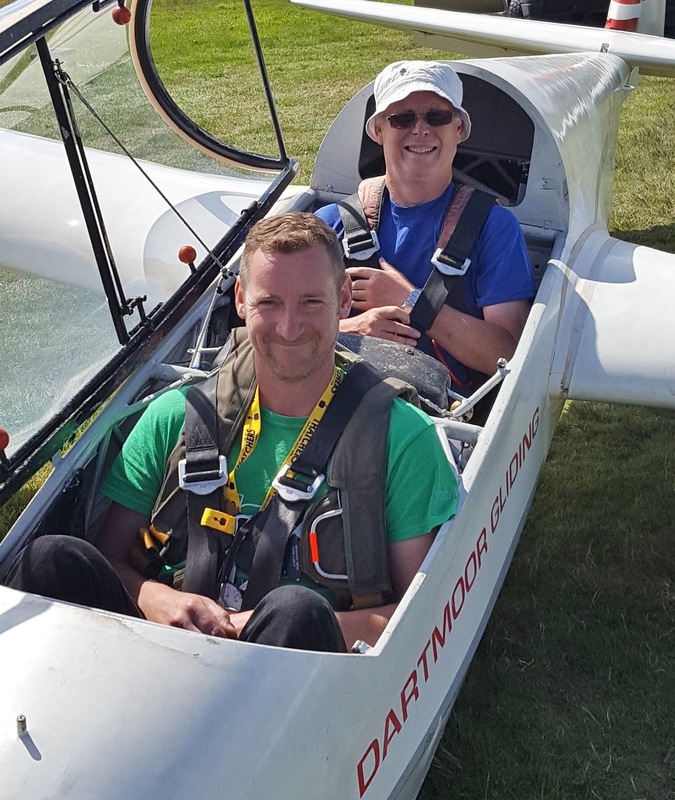 It was very pleasing to see local pilot Dene ( Scratch ) Hitchen soaring in his Astir for the 2 hours that he needs to finish off his Cross Country Endorsement. Well done. 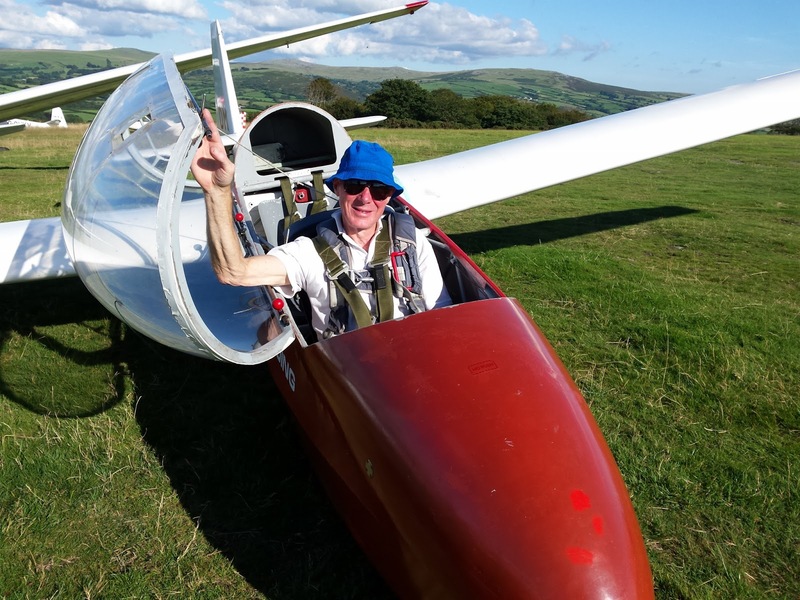 Barry Green celebrated the return of the Zugvogel to the fleet by soaring it for just over an hour returning to make it available for others to use. 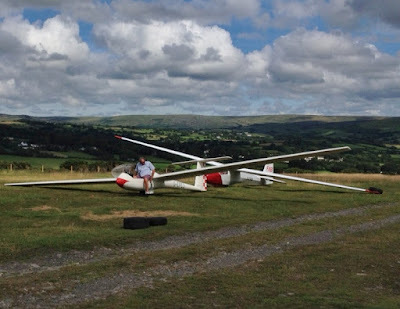 Often in the blogs, the club training gets hardly a mention even though this continues throughout every flying day. 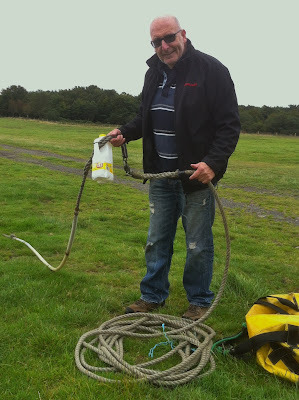 Today was no different but it was good to see that it resulted in Bob Sansom flying solo again. Thanks, as always, are due to everyone who helped run the airfield, especially Barry and Heather for winch and retrieve respectively. 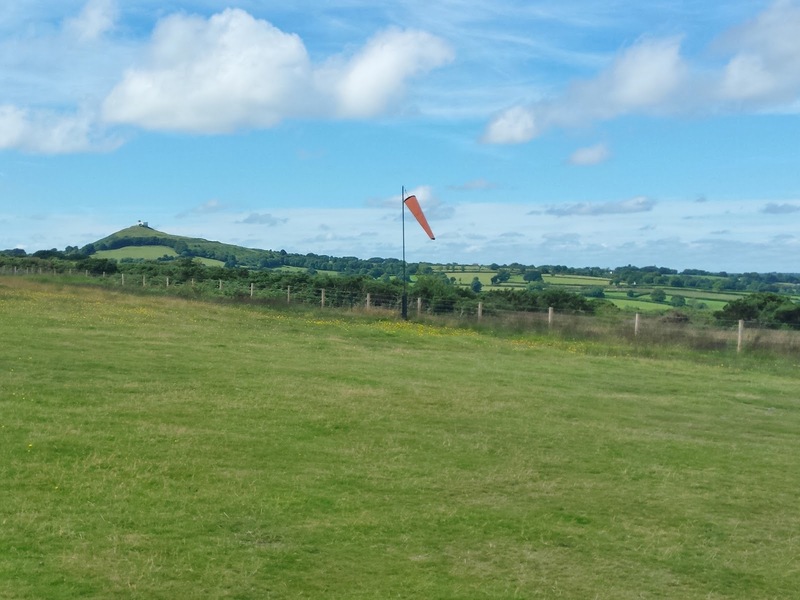 The question today was not is it going to rain, but … when? 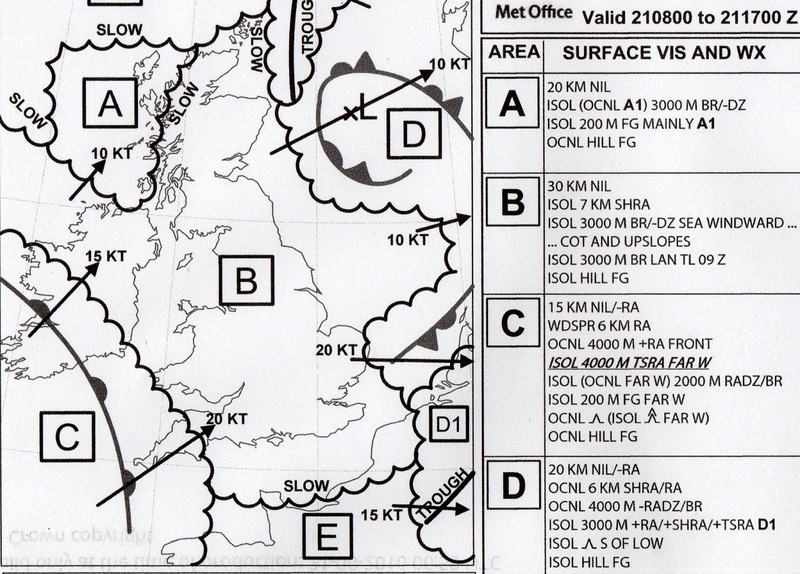 The Met Office chart showed a warm front crossing the SW peninsula at about 1300 local. The BBC (which no longer uses the Met Office for its science) forecast cloud/rain from 1530. Bets on the field fell from anytime after 1400. 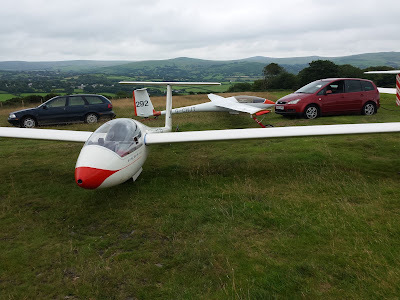 And so, under a breezy westerly, albeit 7/8 cloud cover, we got the kit out. Met Office Forecast for today. Richard Roberts and Dave Downton tow K-13 HXP to the east end under an interesting sky. 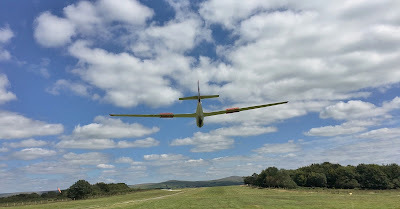 And there was every reason to do so, with Gordon Dennis's friend from Shennington Clive Smith plus Dave Downton's F&F to fly we would have been remiss not to... Hopes were high throughout the morning, particularly in view of the westerly delivering launch heights of around 1,400ft, however, by 1230 it had to be admitted that: a. cloudbase was reducing, b. there was actually precipitation in the atmosphere and c. the view in a westerly direction was not improving. 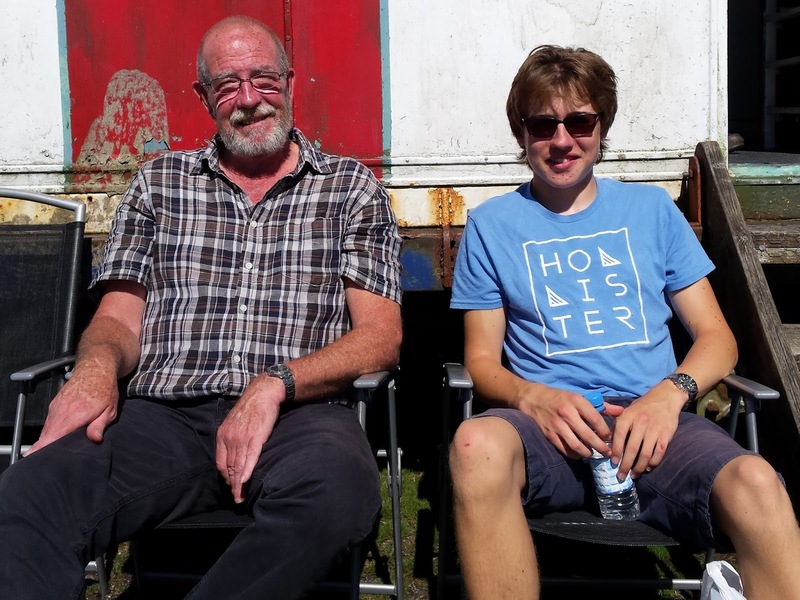 seen here with son Samuel and IFP Roger Appleboom. 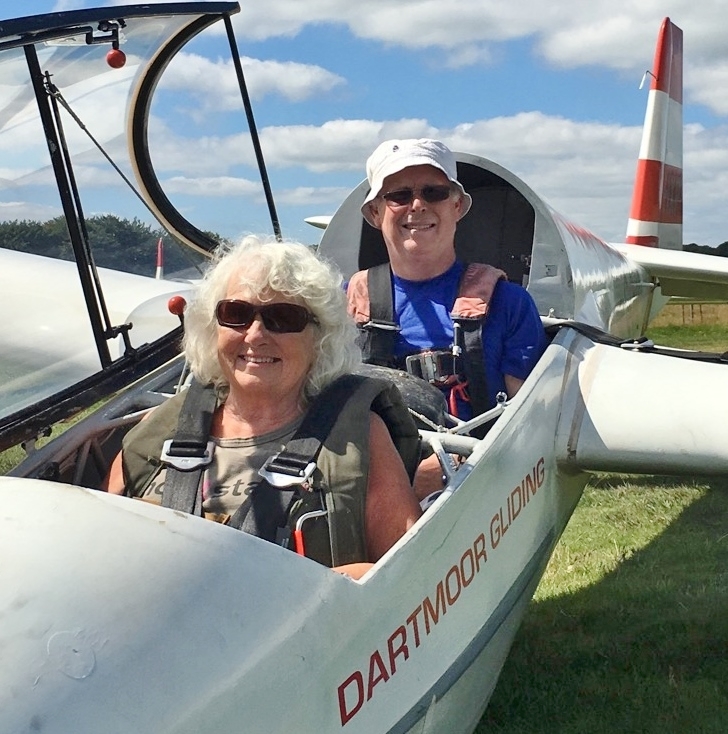 Highlight of the Day, in addition to Clive Smith's longest flight at 8 mins, was Jo Harley's flight with Roger Appleboom. 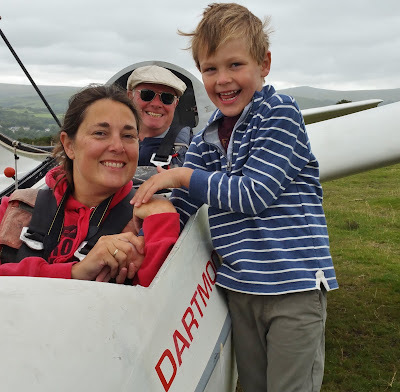 Jo (Joanna) is Dave Downton's daughter and was not sufficiently hampered by son Samuel to prevent herself from aviating with IFP Roger Appleboom – indeed she declared she might become our next full flying female member..! The situation at 1230: cloud begins to envelop Brentor Church. 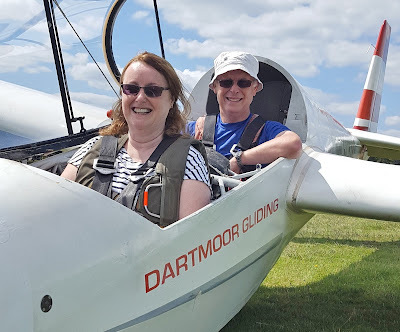 Avid readers of this blog will remember that last Sunday we had to take our borrowed K-8 off-line due to separation detected between skin covering and rib on one of the wings. 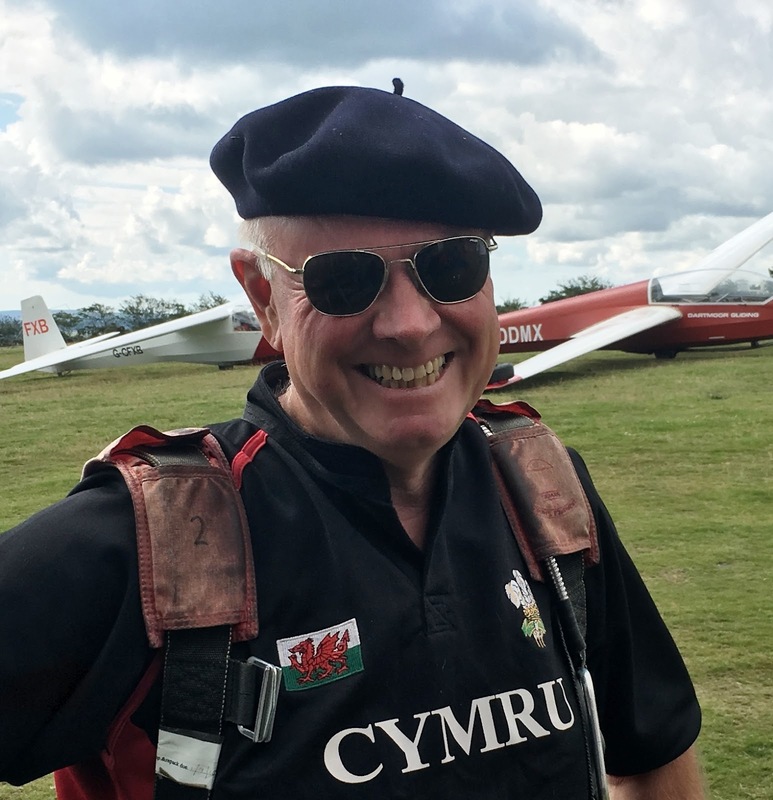 Investigation by club Inspector Colin Boyd revealed that both wings were affected, however with an intensive campaign of rectification, with the assistance of 'new boy' Dave Downton, by Friday he had the K-8 back on line, for which we all owe Colin a huge debt of thanks. 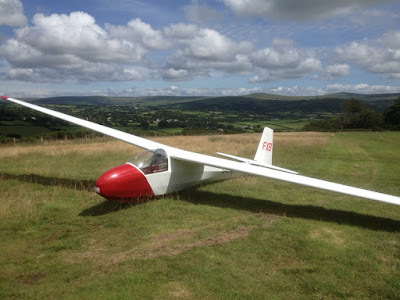 Solo pilots and 'privateers' such as Martin Broadway, Adrian Irwin and Josef Nobbs explored conditions that supported extended, if not sustained, soaring flight and, as the afternoon progressed, the wind, which had always been been tantalisingly somewhere around north, veered to the south, however if a sea breeze convergence formed it was not evident (indeed towards the end of the day conditions were delightfully smooth and predictable). 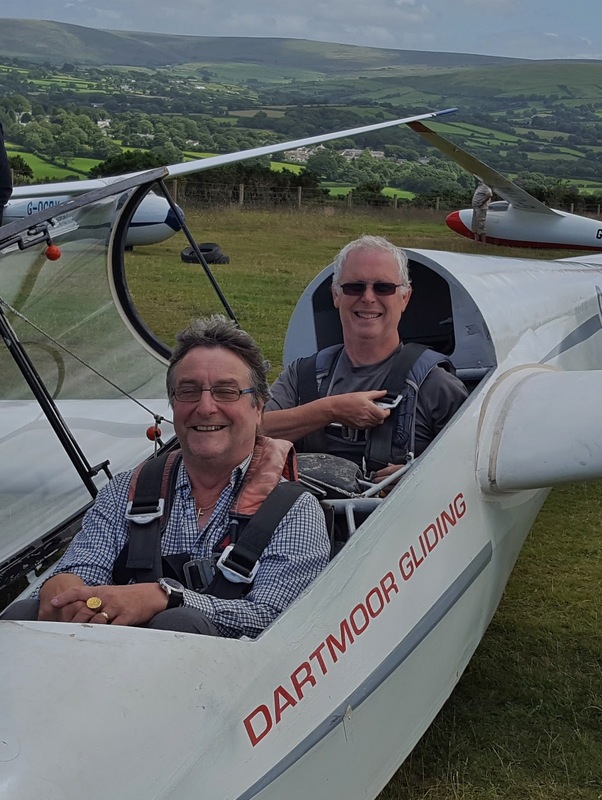 With many bookings and only one K-13 available it was almost a mini-Open Day, with IFP Peter (“Speedy Gonzales”) Howarth flying seven visitors (average flight time 18 mins which means that five out of six visitors were treated to soaring flights on their visit to Brentor today ) before we were even able to contemplate the Club Trainee list – hence some trainees lost out on numbers of launches, but all flew. Ben Popavach, Freya’s son, also flew with Peter Howarth. David and Adam Flook were our first two visitors today. 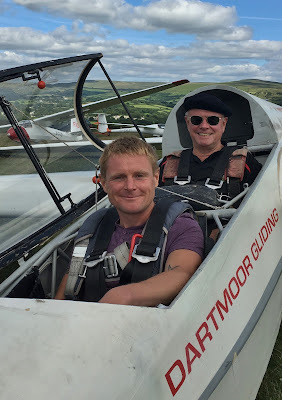 Richard Horton with Peter Howarth. Sally Denner flew with IFP Peter Howarth. So from late start, to derigging the K-8 at the end of the day, and with only one K-13 to support all two-seat flying, we managed 34 launches. Not bad. 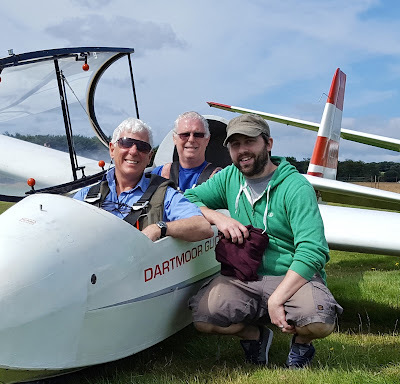 Thanks go to all who patiently participated in, and adapted to, the needs of an enjoyable day's flying – in particular club trainees Phil Selwood, Mike Bennett, Callum Doyle, Dave Downton and Ed Borlase who welcomed others, whilst waiting for, their own flying. That's what we do. The weather today would test the patience of a saint. Low cloud and drizzle thanks to the weak frontal system sitting overhead the north coast. The conditions were forecast to clear for 3pm. Initially there was a useful turnout of members getting on with jobs around the airfield but as the miserable conditions continued several drifted away to take care of family business, etc. By mid morning we had reluctantly cancelled the visitors planned for today. Meanwhile Rick Wiles and David Bouchier continued their work on the "new" ML winch and are really making progress. 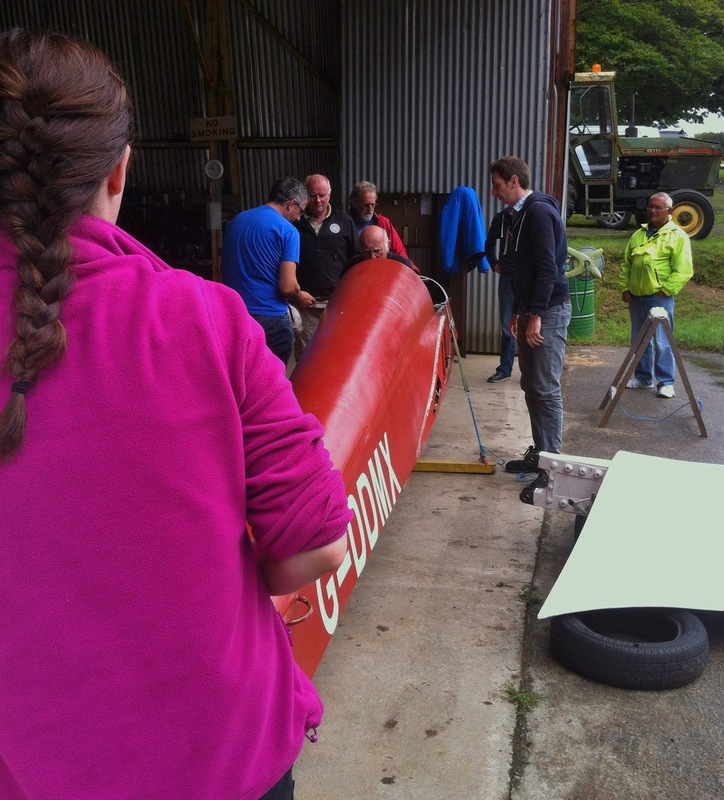 In the hangar, Colin Boyd, assisted by Steve Fletcher were working away on the club aircraft. Saint Ged and Saint Steve ready the K13. Around 2pm the conditions started to clear. 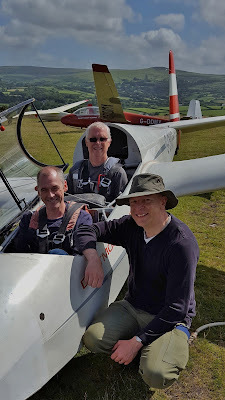 Enter Saint Ged, Saint Scratch and 2 Saint Steves who had waited out the weather and were determined to fly. A K13 and the winch was quickly readied and the first flight was waiting to go as the sky really cleared at 3:15pm. I would like to say that we were treated to booming thermal conditions but that would be too much like a fairy tale. The flights were circuits for the most part with a couple extending to a mind blowing 8 minutes. Tomorrow looks like a good day. 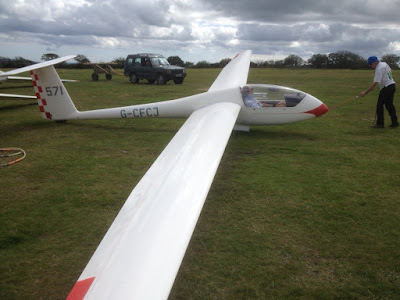 At this 'typical' gliding club we normally have two K-13s and a K-8 available; today we were down to one K-13 (whilst the other is being prepared for its annual CofA) and it was not long before the K-8 was also taken off-line, the result of an eagle eyed DI'er who spotted that the fabric was detached (not broken, just separated) from one of its wing ribs... So, were we downhearted? Not a bit of it! In 'typical' gliding club style, and with permission from Inspector Colin Boyd to rig the second K-13, (and 'happy' with the instruction from him to de-rig the glider again at the end of the day... plus the K-8!) we set to with a will (see photo) – the cloudbase being below launch height but forecast to rise giving us every incentive. Rigging K-13 G-DDMX whilst waiting for the cloudbase to rise. Peter Howarth was Introductory Flight Pilot today, flying with Philip Shears, Sefton Green, Lawrence Hands and Cristina Nartea (see photos), in the morning. Peter is a very good 'thermal sniffer' (as shown by a 13 minute flight with Sefton Green on the third launch of the day) which prompted the private owners to get their steeds into the air (Robin Wilson achieving 1 hour and Roger Appleboom 25 mins in their respective K-6s before lunchtime). 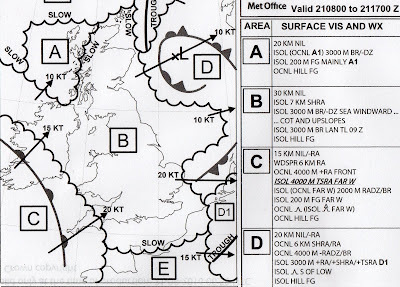 The day then very rapidly overdeveloped, with spread-out yielding no lift at all, and the due west surface wind betraying a gradient and shear to the south that could have 'gotchered' those who opted for a north side, right hand circuit. After the spread-out dissipated, however, the clouds recycled such that, in the afternoon, it really was a matter of chance whether you struck lucky or not..
Philip Shears was also an early flier with Peter. Visitor Sefton Green flew with IFP Peter Howarth. Lawrence Hands looks happy to hand control to Peter Howarth. Rich Roberts managed 10, 9 and 7 mins in his K-6, (but did produce the stunning wingtip photo featured here), whilst Leith Whittington test flew his Dart 17R following inner tube 'creep' and Peter Howarth flew with visitor Elizabeth Ferrie (see photo). Final visitor of the day Elizabeth Ferrie, with her Dad, Peter and Paula Howarth. View from Richard Roberts’s wingtip as he centres his K-6 in a thermal over Brentor. After his business trip to Canada, it was really good to see Jerry Wellington back on site who, after the requisite check flights – including a quick soar to 2,000ft at 5:45pm, was able to get back into his K-6 for one of the final (if that's possible) launches of the day. 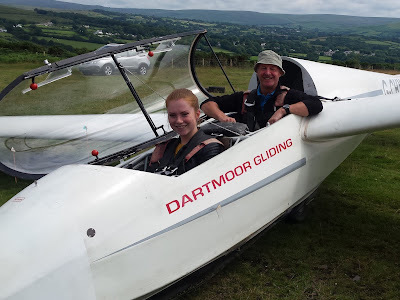 The final launch, with trainee Philip Sellwood flying the launch for the first time, was number 35 - not bad for a 11:41am start. 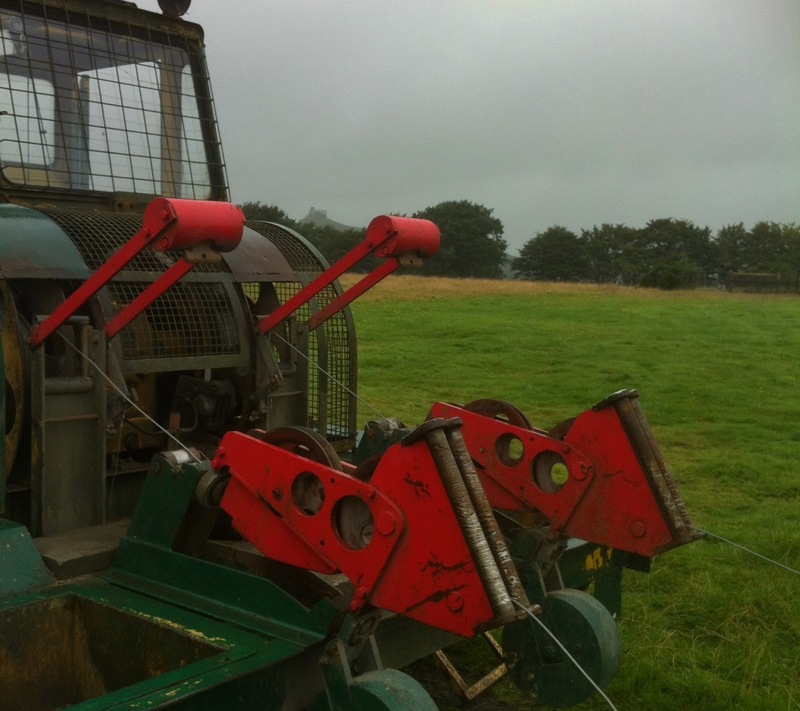 manages to generate electricity through the Dartmoor gloom. 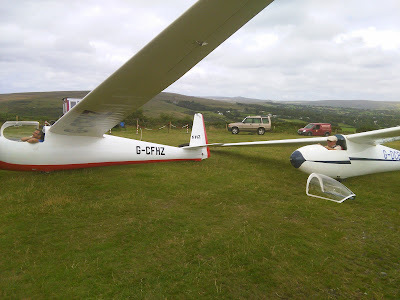 Thanks go to Heather Horswill for retrieving, to Barry Green for winching, to Joe Nobbs for learning how to winch (we need more people like you...), to Jeff Cragg and Jorg Beasley for attending without being able to fly (largely due to the low cloudbase late start) and to all those who welcomed, helped and hosted our steady stream of visitors today; a recently published email on the forum shows that it is appreciated. Today was a complete tease. 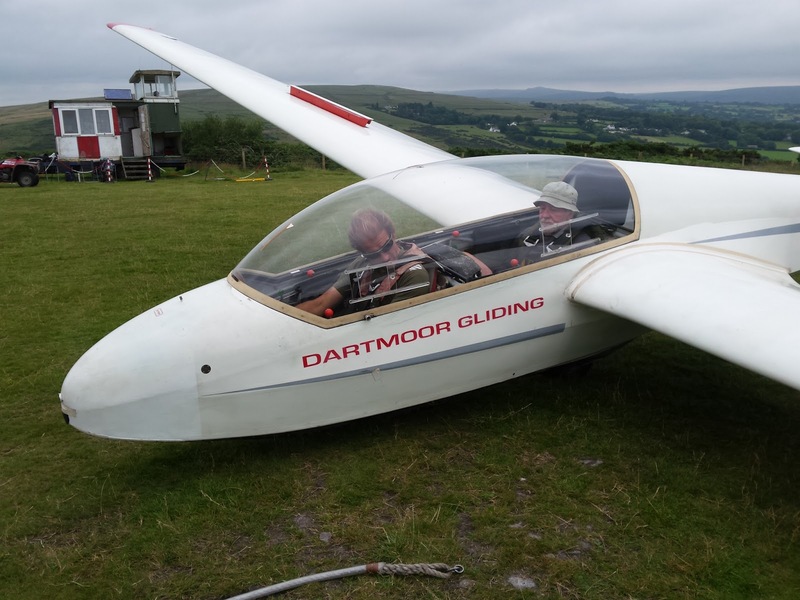 Following a reasonable RASP forecast several pilots decided to rig their own aircraft. The yellow areas indicate rising air of 400 feet per minute. We ended up with an impressive looking grid with Martin Broadway's ASW20, Steve Raine and Mike Jardine Astir, Chris Owen and Peter Harvey Standard Cirrus, Ged Nevisky and Phil Hardwick Twin Astir, plus club aircraft K13 G-CHXP and the K8. The weather just did not happen as forecast. 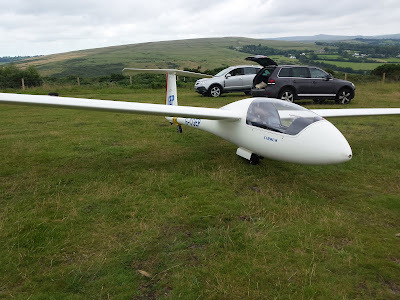 The cloudbase was low(ish) and got lower as the afternoon wore on. The wind stayed mostly southerly and there were only a few sunny periods. All this meant that the promised thermals just did not really happen The best flight of the day was a mere 20 minutes by Ged and Phil in the Twin Astir. A couple of others managed to extend their circuits a little, but that was all. Meanwhile in the hangar, Rick Wiles and David Bouchier were inspecting the "new" winch, an ML with less than a third of the hours of our existing one. The winch has been left unused in a hangar for 10 years or so and needs some TLC ( new bearings, brakes adjusted, new fuel and batteries etc. 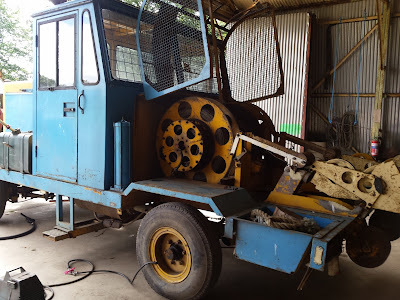 By the end of the day, the winch engine was running well and many parts had been inspected and a "to do" list raised. The day started overcast and low cloud. 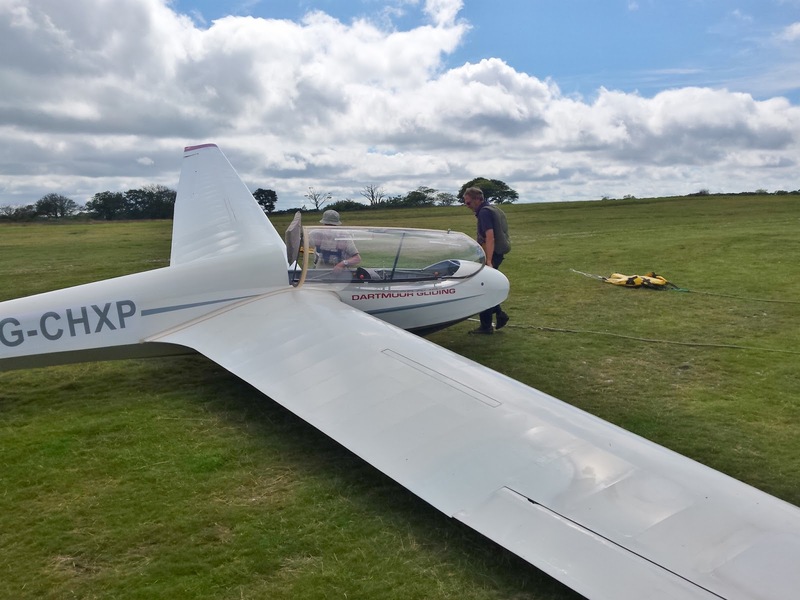 It was to be a day of mixed fortunes, some thermals built early on but lots of sink too, but there were windows where they strengthened as the day went on. The K8 waits patiently for the thermals to strengthen. 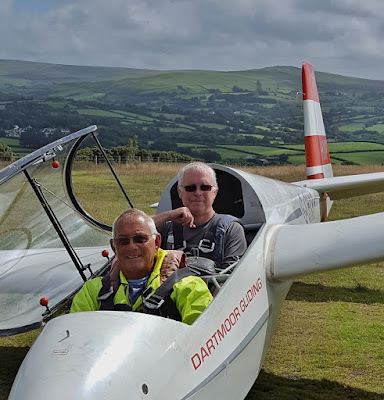 Mike Gadd in his open cirrus getting the best flight of the day with 1 hour and 15 mins, Colin Boyd did well in his k6 and Barry managed 57 minutes in the k8 showing up my 9 minutes! Adrian took his partner for a couple of flights. 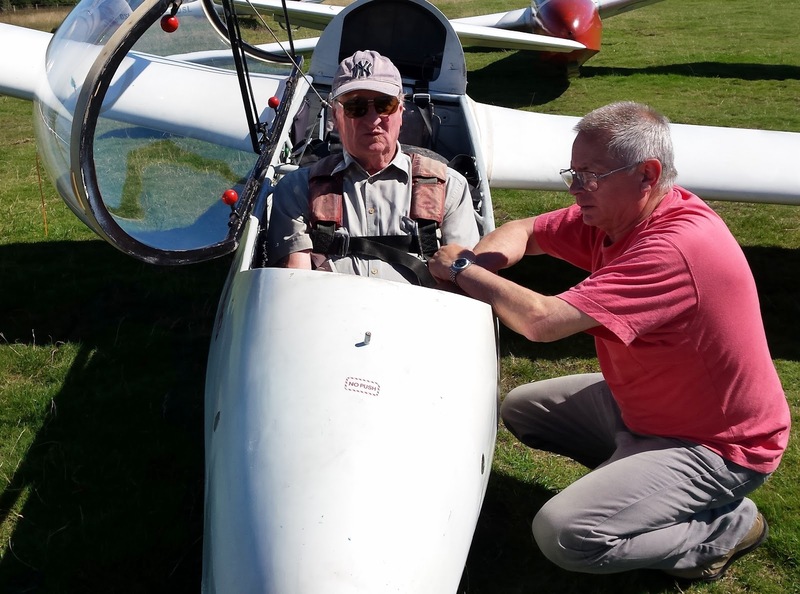 Bob Sansom and Ged managed a half hour flight early on in the k13. Many thanks to Heather for driving the cable retrieve vehicle all day delivering the cables with a smile every time. 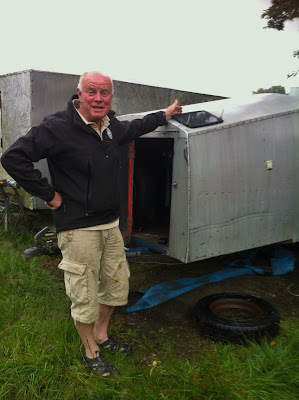 “Bonjour!” Franco-Welsh Dresser Monsieur Roger Pomme de Boom! 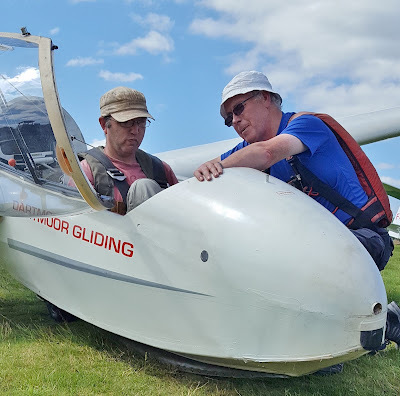 The day began with a reassuringly benign forecast, (240 10 kts plenty of sun and cloud building to 3.5 on RASP at 3pm) and an equally promising turnout, Roger Appleboom being first to launch with One day Course student Andy Brann. Roger, aka Monsieur Rogèr Pomme de Plume, was sporting a super-sized French beret from his latest motorbike trip to France which, coupled with a Welsh rugby shirt, definitely made him the most colourful member on site today (see photo). 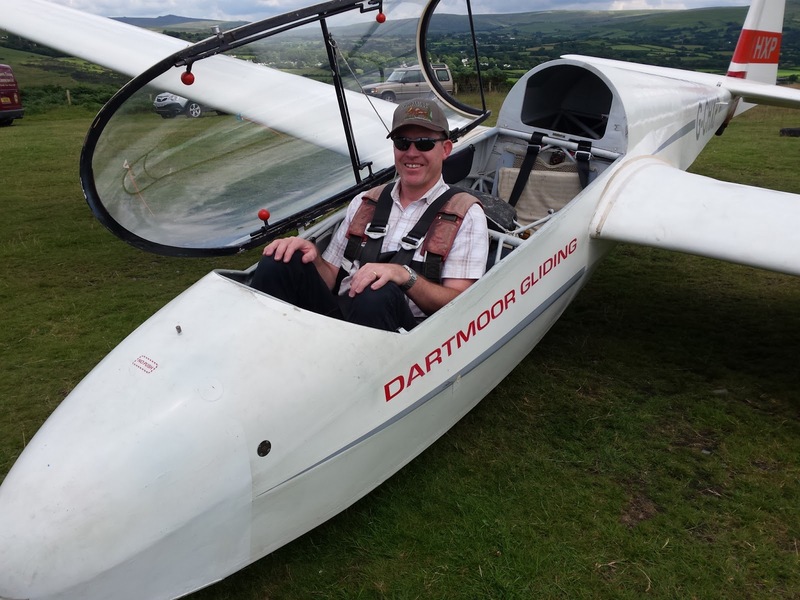 Other visitors who flew with <> included Garry Foster (see photo), Christian Chourot and Mark Pearce. 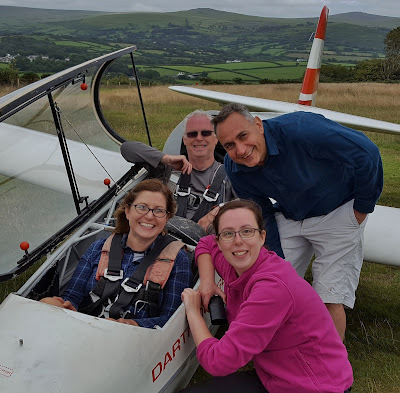 On the trainee side, Ed Borlase and Paula Howarth went to ASDA (if you don’t know what it means, there’s only one way to find out…) whilst Phillip Sellwood, Dave Downton and Adrian Irwin were given less silly things to do. 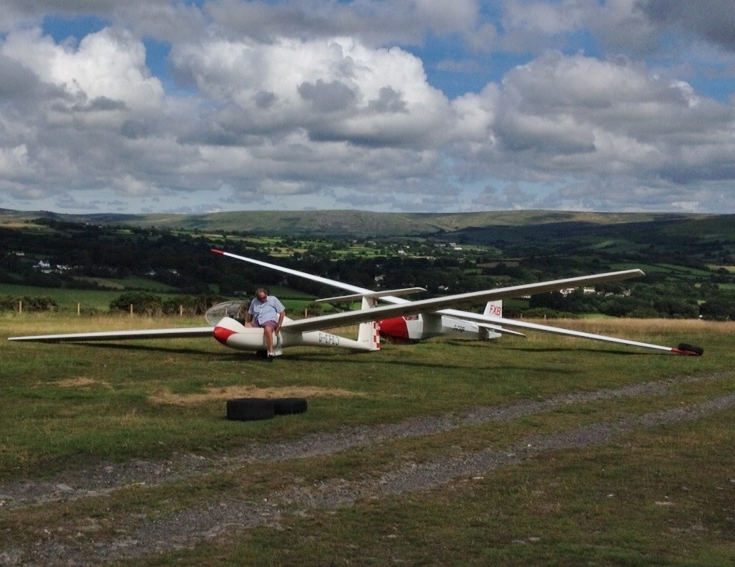 Sadly, today saw the last opportunity for Irish American visitor Peter Flanagan to fly with us. 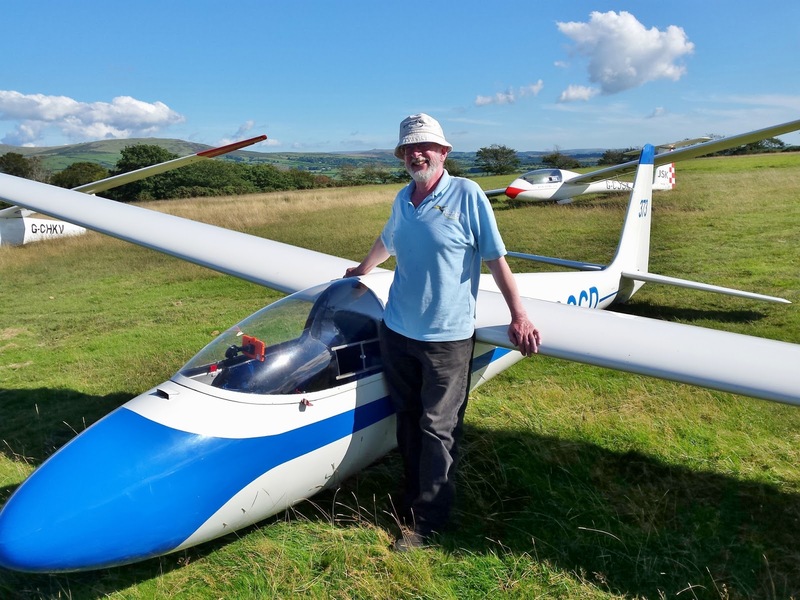 Peter, who normally flies with the Long Island Soaring Association, had planned to fly with three or four gliding clubs whilst on holiday in the UK; in the event he came, saw and remained, with us. Trainee Dave Downton preparing to commit aviation with Martin Cropper under an interesting sky. So what of the conditions? Well, after conforming with the aforementioned benign beginning, it wasn’t long before T-shirts and shorts were soon being supplemented by legs and fleeces as the wind veered to the NW and increased in strength. 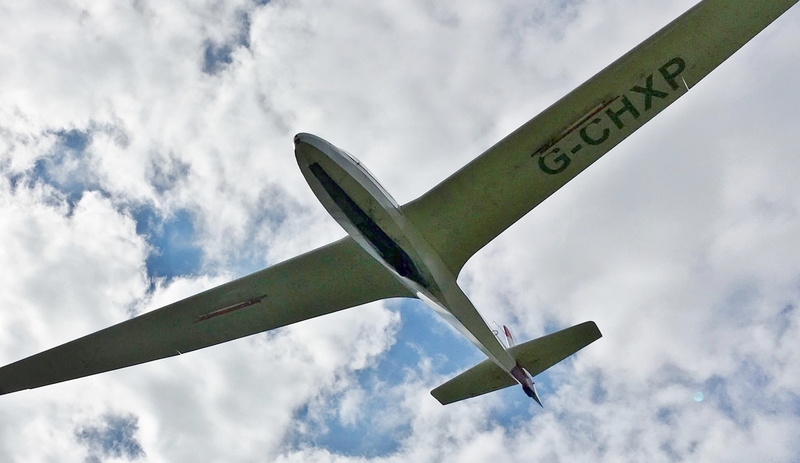 That didn’t dampen spirits, however, for one in every five launches managed a soaring flight and hence the prospect of staying up kept hopes alive (some saw +8kts on their electric varios), even though the gaps between the cu gradually got greater. 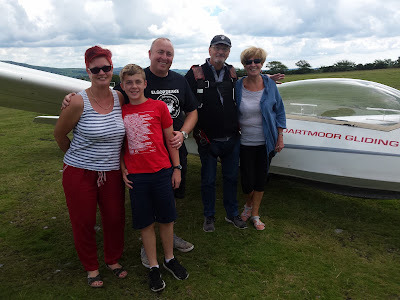 Flight of the Day was claimed by Richard Roberts who, launching at 4:30pm, achieved a flight of 1 hr 37 mins at heights between 2,500 and 3,000 ft which took him to Cornwall and back. 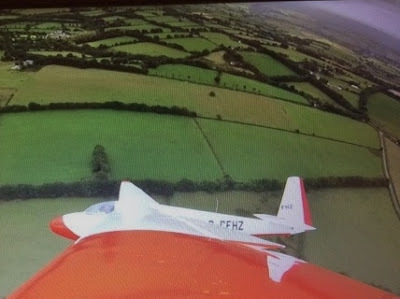 Significantly, third longest flight of the day, at 22 mins, went to Karon Matten who made good use of her ‘soaring in straight lines’ technique (as later copied by Josef Nobbs in the K-8 for 32 mins). ‘K-8 launch illustrating how cloud became more broken in late afternoon’. At the end of the song “dreadful sorry” Clementine is “lost and gone forever” having drowned in “foaming brine”. Does the same apply to the Sunday Soarers - not a bit of it! We’ll be there next Sunday searching for that 49-er plus one, or even two, or more...! Thanks go to all those who ‘facilitated’ today, including Peter Howarth, who ‘endured’ two spells on the winch, and Barry Green who winched without flying. The forecast was suggesting a training sort of a day. Overcast early, giving way to some sunny periods later all with light breezes from the NW. That was just about what we got. There a period of soarable conditions in the mid afternoon to spice things up a little. The day got off to a relatively early start as instructor Gordon Dennis played truant from his home duties to ensure some extra flying to the members of this weeks course who had the worst of the weather and only managed 2 flying days out of 5. Thanks Gordon. Your efforts are appreciated. 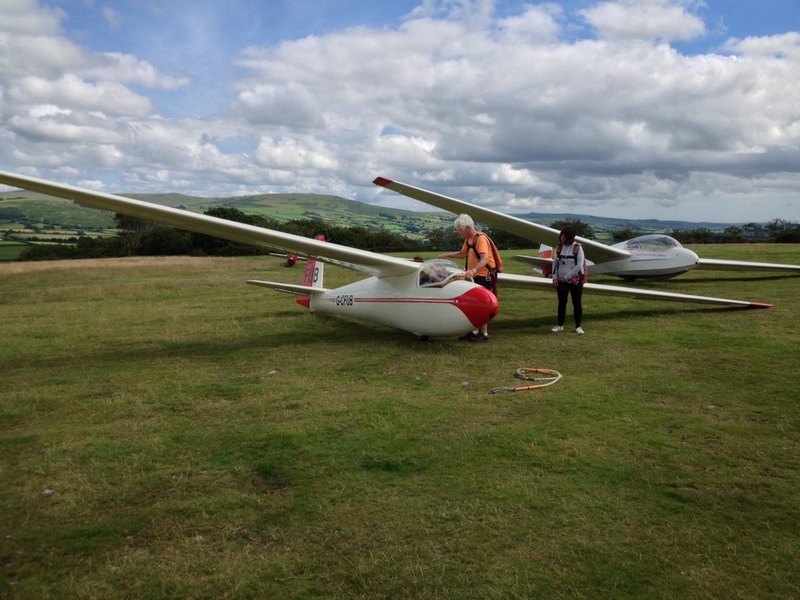 Conditions improved during the early afternoon when some short soaring flights were made.